Charlie Blackmon has had a great impact at the plate and in the field for Colorado. This Charlie Blackmon doesn’t just hit. Blackmon, besides leading the majors with a .402 batting average, also is playing astonishing outfield defense. Defensive metrics aren’t terribly reliable, especially in a small sample. Still, it’s revealing that Blackmon already has accounted for seven defensive runs saved, according to Baseball Info Solutions – at three different positions. That’s right, Blackmon has saved two runs in 16 innings in left, three in 108 innings in center and two in 50 innings in right. Braves right fielder Jason Heyward leads all outfielders with 13 defensive runs saved. As for Blackmon’s hitting, he surely won’t finish the season with a 1.120 OPS, but the Rockies do not consider his performance all that surprising. Blackmon, who turns 28 on July 1, batted .309 with an .803 OPS in 258 plate appearances last season. Some viewed Blackmon, a second-round pick out of Georgia Tech in 2008, as a tweener, a player who did not run well enough to handle center or hit for enough power to handle a corner. Well, the Rockies’ offseason trade of center fielder Dexter Fowler gave Blackmon his chance, and it appears there is no turning back for either the player or team. Blackmon gets terrific breaks and reads in center, a position that is not easy to play in Coors Field. Hitting leadoff, meanwhile, requires him to see more pitches, and he also is faring well in that area, seeing 3.98 per plate appearance. 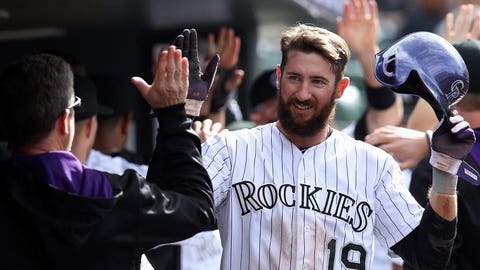 *The two players the Rockies acquired for Fowler, right-hander Jordan Lyles and reserve outfielder Brandon Barnes, both have made significant early contributions. Lyles, 23, has impressed club officials with his poise and ability to induce groundballs, producing a 2.93 ERA in his first five starts. Barnes, 27, brings toughness and energy, and has produced an .869 OPS in 60 plate appearances. *The prevailing wisdom about the Rockies is that they cannot win without major efforts from shortstop Troy Tulowitzki and left fielder Carlos Gonzalez. The two, though, went a combined 2-for-26 at Dodger Stadium over the weekend, and the Rockies took two of three. Gonzalez has been mostly quiet in April, producing just a .713 OPS. Keep in mind that the Rockies’ offense should further improve when right fielder Michael Cuddyer returns from a strained left hamstring. *The Rockies’ infield defense is so good, the team rarely sees the need to employ shifts. Through Saturday, the Rox had shifted only 17 times, according to STATS LLC. Only the Phillies, with 11 shifts, had fewer. Tulowitzki leads all shortstops with nine defensive runs saved. Third baseman Nolan Arenado is good for practically a highlight a day. And DJ LeMahieu is emerging as one of the top defensive second basemen in the NL. *Pitching, of course, remains the biggest question for the Rockies, who rank 13th in the National League with a 4.13 team ERA and next-to-last with a 4.27 rotation ERA. But here, too, there are reasons to believe that the team might be OK.
Right-hander Jhoulys Chacin is working his way back from a right shoulder strain. And the loss of lefty Brett Anderson with a broken left index finger had something of a silver lining — Anderson threw only 44 2/3 innings last season, and cannot be expected to go 180 to 200 this year. The Rockies also have two top prospects, right-handers Eddie Butler and Jonathan Gray, continuing their developments at Double A. The White Sox’s pitching success took root in the late 1990s when Ken Williams was the farm director and Don Cooper the minor-league pitching coordinator. The team developed not only a philosophy, but a continuity of instruction, teaching pitchers in the minors the same way it taught pitchers in the majors. The process became so consistent, the White Sox’s scouts came to understand Cooper’s preferred deliveries and pitch types as he ascended to the major-league job. So, when general manager Rick Hahn sought a replacement for hitting coach Jeff Manto last offseason, his goal was to replicate the team’s pitching success on the hitting side. The hiring of Todd Steverson, a former major-league coach and minor-league manager with the Athletics and minor-league coach with the Cardinals, appears to be a positive step in that direction. The White Sox are second in the majors in runs per game, and their offensive success is one of the season’s early surprises. Obviously, newcomers such as first baseman Jose Abreu and outfielder Adam Eaton are making an impact. But shortstop Alexei Ramirez and outfielder Dayan Viciedo have shown improvement under Steverson, and Avisail Garcia also was progressing before he required season-ending surgery on his left shoulder. Steverson’s philosophy hardly is revolutionary – he preaches "selective aggressiveness," urging hitters to lay off pitches they can’t handle and pounce on the ones they can. Still, if Steverson turns into a pitching version of Cooper, the White Sox will be even better positioned to re-emerge as a force. On the morning after the Dodgers were eliminated by the Cardinals in last year’s NLCS, general manager Ned Colletti spoke with infielder Dee Gordon in the lobby of the team’s St. Louis hotel. The conversation was a reality check for Gordon. Colletti told him that Hanley Ramirez would be the Dodgers’ everyday shortstop next season, and that no team had made a trade offer for Gordon that made sense. Gordon, then 25, wasn’t good enough offensively or defensively. Colletti suggested that he go to winter ball and learn to play second base and the outfield to become more versatile. He even mentioned Chone Figgins, a player whom the Dodgers had not yet signed and who had sat out all of 2013, as a role model. He twice went to winter ball in Puerto Rico, learned to play second and emerged as the Dodgers’ most pleasant surprise of the first month, showing aptitude at second and producing a higher OPS (.867) than both Ramirez (.857) and Yasiel Puig (.821). He’s a different hitter now, too — Gordon, who hit 71 percent of his balls on the ground in his first three seasons, is up to 78 percent this season, 14th-best in the majors (the Rangers’ Elvis Andrus is the leader at 89.3 percent; the Reds’ Billy Hamilton, at 54 percent, isn’t in the top 100). Once on base, Gordon is his usual havoc-wreaking self. He leads the majors in stolen bases and has been successful in 13 of his 14 attempts. The Dodgers’ decision to give left-hander Clayton Kershaw one more rehabilitation start makes sense. Kershaw likely will be on an 80-pitch limit in his next outing, which means he might not go deep into the game. Besides, the Dodgers visit the Twins this week, and the forecast for Minneapolis is cold and rainy – not ideal conditions for a pitcher recovering from a strained lat. In the big picture, it’s also not a bad idea to preserve Kershaw’s major-league innings. He threw a total of 259 last season, and even after missing five weeks could enter the postseason with around 200 innings if the Dodgers qualify. So, we’re talking about a potential 500 innings over two seasons, a high workload for a pitcher who is in the first year of a seven-year, $215 million contract. Kershaw, 26, is not some prospect who needs babying, but the potential effect of the wear and tear is daunting. Consider that Giants right-hander Matt Cain threw a combined 244 2/3 innings at age 25 in the Giants’ 2010 World Series run and 249 1/3 innings while helping the team win the championship in ’12. For whatever reasons, he hasn’t been the same pitcher since. So, how did Angels lefty Hector Santiago enjoy his homecoming to Newark, New Jersey? Well, he had a subpar outing on Saturday against the Yankees, lasting only 4 1/3 innings. And for good measure, he had his car radio stolen while staying at his parents’ house on Friday morning. The car is a 2008 Nissan Altima, and Santiago said he stores it in a garage when he is not home. He parked it in his parents’ driveway after returning home at about 1:30 on Friday morning. His father, Hector Sr., awakened him at 5 to tell him that thieves had broken into both of their cars and stolen their radios. Santiago said this was not the first time he had his radio stolen, and he actually admired the thieves’ handiwork. 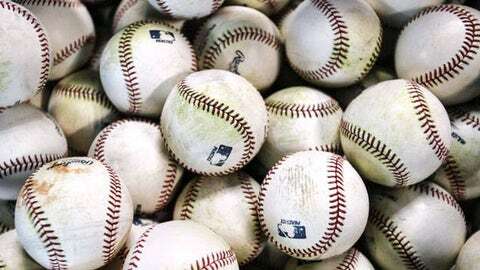 *One potential solution to the pine-tar problem could be in the Japanese ball, which is made with a tackier leather that allows for a better grip as soon as it is removed from the package. Pitchers presumably would not require as much pine tar in cold weather if they used such a ball, and maybe they would not need the substance at all. "I’d be curious to see that ball," said Joe Torre, MLB’s executive vice president of baseball operations. *Angels GM Jerry Dipoto said that during Mike Trout’s contract negotiations, Trout’s agent, Craig Landis, repeatedly mentioned that his client will hit for more power. 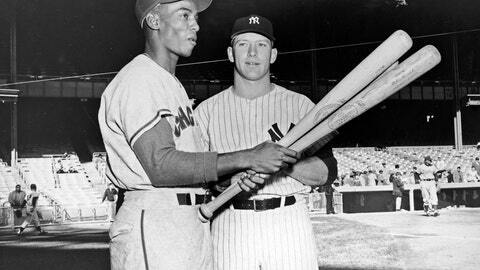 Dipoto did not disagree, saying, "Why on earth would we think that we’ve seen the height of his power production at age 20-21?"
A 40-homer season indeed appears possible for Trout, and if it happens, Angels infielder John McDonald says it will be a "quiet 40." Trout’s homers won’t necessarily come in bunches, McDonald explained. He’ll just keep hitting them consistently, all season long. *The Phillies, after losing their first two games to the Rockies, went an impressive 6-4 on their trip to Colorado, Los Angeles and Arizona. Still, the team’s right-handed relief after Jonathan Papelbon and Mike Adams remains alarmingly thin – and Adams, coming off shoulder surgery, needs to be handled with care. Right-hander Ken Giles is throwing 98 mph at Double A with a 21/3 strikeout-to-walk ratio, but this is his first season above Class A. An outside addition would be helpful – Brad Lincoln, B.J. Rosenberg and Justin De Fratus have not proven to be the answers. *Speaking of the Phillies, shortstop Jimmy Rollins has been an "ideal citizen" in the view of one clubhouse observer. Rollins is even taking on a leadership role with the team’s younger players, something he hasn’t always done in the past, the source said. Maybe Rollins committed to a new beginning after his spring-training dust-up with manager Ryne Sandberg. Maybe he wants to ensure that he makes 434 plate appearances to vest his $11 million option for 2015. In any case, Rollins has been impressive both on and off the field. *The insertion of Vidal Nuno into the rotation leaves Matt Thornton as the only experienced lefty in the Yankees’ bullpen, and the team eventually might need to fill that void. Some with the club, though, still think that the team’s biggest bullpen need is an eighth-inning setup man. That way, manager Joe Girardi could use Thornton and Shawn Kelley in the seventh, and build a solid bridge to David Robertson in the ninth. The continued ascendance of righty Dellin Betances, however, would put the Yankees in a stronger position. Betances has reduced his repertoire to two pitches as a reliever, and thus far has produced a 0.77 ERA in 11 2/3 innings, with 19 strikeouts and seven walks. *Expect the Angels, who promoted right-hander Mike Morin from Triple A on Sunday, to summon at least two other relievers from the minors this season with the goal of finding long-term solutions for their bullpen. Morin throws 90-94 mph with an above-average changeup. Double A right-hander R.J. Alvarez throws 93 to 100 with a power breaking ball and decent changeup, but his command is a work in progress. And then there is Double A right-hander Cam Bedrosian. Bedrosian, the team’s first-round pick in 2010, is the son of Steve Bedrosian, the Cy Young Award-winning closer in 1987. He throws 94 to 98 mph with a power slider, and his combined performance thus far at Class A and AA has been astounding: 23 of his 29 outs have come by strikeout. *Right-hander Archie Bradley hasn’t exactly lit it up at Triple A since his agent, Jay Franklin, told Fox Sports that the pitcher deserved to be promoted to the D-Backs’ struggling rotation. At the time, Bradley had a 1.50 ERA after two starts. He has an 8.76 ERA in his three starts since, and did not complete five innings in any of them. For the season, Bradley has struck out 23 and walked 12 in 24 1/3 innings.